"Leave that bag of frozen french fries in the freezer because these fries are just about as easy to make. They just might become your new favorite fries. An ice-cold bottle of beer is the perfect side kick." Preheat oven to 425 degrees F (220 degrees C). Line 2 baking sheets with aluminum foil; spray with cooking spray. Mix oil, seafood seasoning, onion powder, hot sauce, and garlic powder together in a bowl. 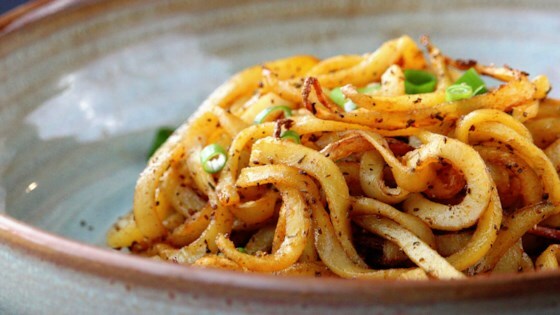 Cut potatoes into spirals using a spiralizer fitted with a large shredder blade; snip long spirals into smaller lengths. Place potatoes into a large bowl; drizzle with oil mixture. Toss until potatoes are evenly coated. Spread coated potatoes in a single layer onto the baking sheets, leaving 1/4-inch of space between potato spirals. Bake in the preheated oven until bottom of potatoes are browned, 8 to 9 minutes. Flip potatoes with a spatula. Bake until potatoes are browned and crisp on top, about 6 minutes. Sprinkle malt vinegar and sea salt over potatoes. See how to make healthy baked sweet potato fries with a spicy kick. We like our food a little spicier, so I substitute extra virgin olive oil with chile oil. If you don't like the idea of malt vinegar, you can serve with traditional ketchup. There are many brands of spiralizers. The chipper (large shredder) blade referred to in this recipe is from the Paderno® brand.